IMPORTANT: This firmware update must be performed to keep using the Chromecast built-in music distribution service. If you do not manually install the update, it will be automatically installed when there is an active network connection and the speaker is not in use. Don't turn off, or disconnect the home audio system from the AC power outlet until after the update is complete. Turn on the home audio system. Use the arrow buttons to select System, and then press the ENTER button. Use the arrow buttons to select VERSION, and then press the ENTER button. If the Firmware version number displayed is 2.02 or higher, this software update is already installed. The Network Update via Internet method is straightforward and the recommended way to update your home audio system. To use this method, your home audio system must be connected to an active internet connection. This software update process usually takes about 10 minutes, depending on system configuration and internet connection speed. 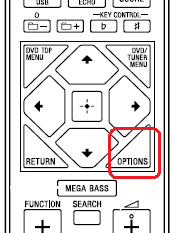 If the home audio system is turned on, press the POWER ( ) button on the system to turn the system off. Ensure the system is connected your network with an active internet connection. Press the POWER button on the system and wait for a few minutes until UPDATE is displayed. Use the arrow buttons to select UPDATE, and then press the ENTER button. Use the arrow buttons to select VIA NW, and then press the ENTER button. Use the arrow buttons to select EXEC, and then press the ENTER button. Use the arrow buttons to select YES, and then press the ENTER button. The update will begin to download, the word UPDATING will blink and the progress from 0% to 100% is displayed. The system will automatically restart in Demonstration mode after the update is complete. Press the POWER ( ) button on the system again to turn it off and then back on. Note: If the version number is 2.02, the software update was successful. Press the POWER button to turn the system off and then back on. Make sure that the system is correctly connected to the internet, and then follow the Network Update procedure again. Q: The message DOWNLOAD ERORR or PUSH POWER is displayed during the update. The internet connection is slow or intermittent, causing the software update to fail. The procedure may not complete properly if the internet connection is slow or intermittent. Press the POWER button to turn the system off and then back on again. Wait about 3 minutes, or long enough to ensure the network connection has been established. Follow the update procedure again. If the software update continues to fail, use the USB Storage Device method to download and install the software update. With this method, you use a computer to download the software update to a USB storage device, and then install it from the USB storage device onto your home audio system. You'll need a USB storage device with 256MB or more available space. If the software update is not successful after following the instructions, you may need to format your device to the FAT32 file system, or use a different device. View formatting instructions. Download the MHC16003.UPG file to a temporary or download directory (please note this directory for reference). Go to the directory where the file was downloaded and verify that the size of the MHC16003.UPG file is 175,636,672 bytes. Right-click the MHC16003.UPG file, and click Properties. On the MHC16003.UPG Properties screen, verify that the Size: listed is 167 MB (175,636,672 bytes). If the file size is different than the 175,636,672 bytes, please download the MHC16003.UPG file again. Drag and drop the MHC16003.UPG file to the root folder of the USB storage device. The MHC16003.UPG file is copied onto your USB storage device. Go to the directory where the folder was created, and then right-click the MHC16003.UPG file. Note: The update will not perform if the folder is not copied to the root directory of the USB storage device or if the name of the folder is modified. After completing copying the MHC16003.UPG file, remove the USB storage device from your computer and continue to the next section. This update process usually takes about 10 minutes to complete. WARNING! Don't turn off, or disconnect the home audio system from the AC power outlet during the update process. WARNING! Don't remove the USB storage device until the update process is complete. Ensure the AC power cord is securely plugged into a working wall outlet. 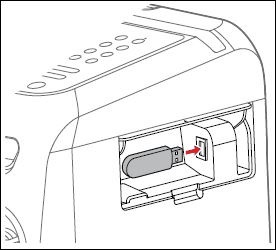 Insert the USB storage device into the USB port of the home audio system. Use the arrow buttons to select VIA USB, and then press the ENTER button. The update begins to download, the word UPDATING will blink, and the progress from 0% to 100% is displayed. Press the POWER ( ) button to turn the system off and then back on. When the update is complete, you may remove the USB storage device from the system. Q: The message FILE ERROR, NO FILE, or READ ERROR/PUSH POWER is displayed during the update. An issue with the file or USB strage device is causing the software update to fail. Confirm your update file is correct, and try again the previous steps again. Use a different USB storage device, and try again the previous steps again.